Two Saudi-led air strikes hit the main entrance to the rebel-held port of Hodeida but the docks were still operating normally on Tuesday, the port's deputy director told AFP. The vital docks, through which 80 percent of Yemen's commercial imports and nearly all UN supervised humanitarian aid pass, has been at the centre of international concern about a new drive to recapture Hodeida which the Yemeni government launched with Saudi-led support on November 1. Monday's strikes, in which port staff said four rebels were killed and four wounded, was the first to hit the docks in 12 days of intensified bombardment and ground fighting in the Red Sea coastal city of some 600,000 people, many of whom have fled or now fear a siege. The main gate "was the target of air strikes... but the port is operating normally," the port's deputy director Yehya Sharafeddin told AFP by telephone. He said three guards had been wounded. Four other port employees told AFP that one strike had killed a rebel commander and three of his guards, while a second strike had wounded another commander and his guards. They said a single-storey guardroom had taken a direct hit from the strikes. Rebel-controlled media reported two air strikes but made no mention of casualties. Saudi-led coalition spokesman Colonel Turki al-Maliki had no immediate confirmation of the strikes but told AFP he would check. Residents of Hodeida reported that the city was calm on Tuesday after a lull in bombardment during the night as Western governments stepped up calls for a halt to the offensive to pave the way for peace talks. British foreign minister Jeremy Hunt held talks on Monday with both Saudi King Salman and his powerful son and heir apparent Crown Prince Mohammed bin Salman. "The heavy fighting stopped on Monday evening. During the night we heard sporadic gunfire but then situation seems stable todat," one Hodeida resident told AFP by telephone. "We are not hearing explosions like we have for the past two weeks." International concern about damage to the port has been heightened by widespread malnutrition after four years of war that has placed some 14 million Yemenis at risk of famine, according to UN agencies. Many more are dependent on food aid. UN Secretary General Antonio Guterres warned on Monday of a possible "catastrophic situation" if the port is destroyed. "The fighting must stop, a political debate must begin and we must prepare a massive humanitarian response to avoid the worst next year," he said. 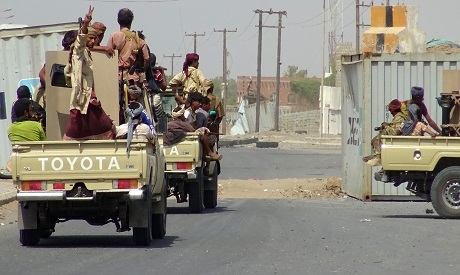 Hodeida has been controlled by the Houthi Shiite rebels since 2014 when they overran the capital Sanaa then swept through most of the rest of the country. The Saudi-led coalition intervened the following year and pro-government forces have since recaptured nearly all of the south and much of the Red Sea coast.